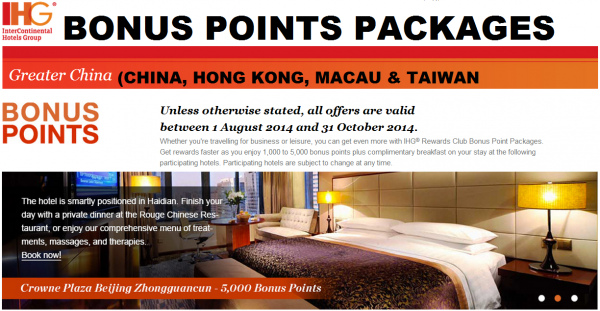 IHG Rewards Club has updated the packages for 1,000 to 5,000 bonus points per stay that are available for their Greater China (China, Hong Kong, Macau & Taiwan) properties between August 1 and October 31, 2014. Note that this requires you to usually purchase a higher rate than the lowest one available and it rarely makes sense from financial point of of view. If someone else is picking up the tap, then maybe. You have to calculate, if the extra points in lieu of lower price, makes sense. Most of the time the answer is definite no, but if someone else is picking up the bill…..